Join the T-Birds and Pink Ladies in Grease, a 5 reel, 20 payline video slot from Playtech that’s based on the ever- popular film. 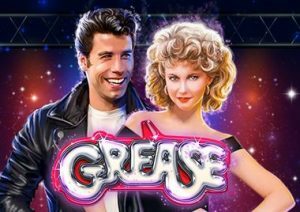 Grease comes with plenty of extras including respins with locking symbols, free spins with added wilds or higher paying symbols only and a multi stage pick me round. Join Danny, Sandy and the rest of the Rydell High gang from between 20p and £20 per spin on all devices. There’s a classic 50s feel to the design in Grease. The reels are set against a diner backdrop and you’ll see vinyl records, milk shakes and classic cars spinning around the reels. More lucrative are the character symbols. There’s Rizzo and Kenickie as well as Danny (John Travolta) and Sandy (Olivia Newton John). The best paying standard symbol is the combined Danny / Sandy which awards up to 25 times your bet per payline. The combined symbol can count as either Danny or Sandy. The Danny and Sandy symbols spin in full stacks. Helloing to create winning lines is the red heart which is the wild. It replaces everything bar the scatter and offers awards of up to 50 times your bet per payline. There’s a good range of features on offer in Grease. You have the Rockin’ and a Rollin’ Respins feature which is played when reel 1 is filled by a Danny or Sandy symbol. You’ll then receive 3 respins. Any symbols that match the Danny or Sandy stack during those respins are locked in place. A full stack of the combined Danny / Sandy symbol also awards 3 respins. Both the Danny and Sandy symbols lock during this round and can count as either symbol. Better Shape Up Free Games feature – pick this and you’ll receive 12 free spins with the lower value symbols removed. Any Danny or Sandy symbols that hit turn into the combined symbol. Summer Nights Free Games feature – 4 free spins are on offer if you pick this round. Not many, we grant you, but your winning chances rocket thanks to the extra wilds that hit on each free spin. You can hit up to 8 wilds each time here. Rydell High Bonus feature – you’ll be shown pictures from the Rydell High year book. Choose a snap to reveal a cash prize (and a clip from the film). There are 5 potential levels here with prizes increasing with each one. Keep on picking until you land a collect. You can win up to 100 times your bet here if the picks fall nicely. Now, there are 2 Greased Lightning Jackpots to be won – you have Sandy’s Jackpot and Danny’s Jackpot. You will enter the jackpot game at random from the base game where you open boxes to reveal Sandy or Danny symbols – get 3 of a character to win the corresponding progressive jackpot. Despite coming out 40 years ago, Grease remains a hugely popular film. This video slot is an entertaining adaptation. The visuals have an old school feel and the instrumental soundtrack will have you humming along. The features don’t disappoint either. Our favourite was the high risk, high reward Summer Nights Free Games feature. There’s always a danger that a video slot can mess up a classic film. Playtech have done a good job with Grease which is worth a spin whether or not you’re a big fan of the original. If you like movie-inspired games, there are plenty about – NetEnt’s Planet of the Apes and Novomatic’s From Dusk Till Dawn are 2 of the better ones.